Needed a Tree Skirt which I am sure you know I could not find so with the help of some Fellow crafters on Etsy I was able to make my own. Made with a old Vintage Card reproduced .by me. Wood Frame measures 15 X 12 and is painted in a Silver with some Black streaks in some areas giving a Antique Look. 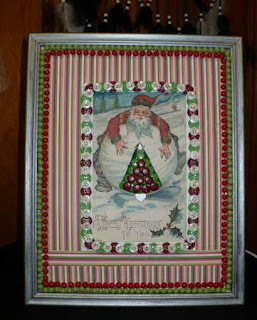 Background is done with a collage of mixing scrapbook paper together, On the edges of the frame I embellished them with both red and green beads taken from two old broken Necklaces I had in my Junk box. The Santa Card measures 9 X 6 and is framed out with Red, Green, and Ivory Buttons. In the center you can see Santa rolling a huge snowball and in the middle of the snowball I made a tree with other smaller buttons and a clear plastic star at the top. I used a silver small heart for the tree stand. 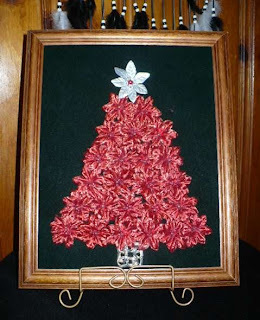 I did make the tree from Styrofoam board to give it a 3 dimensional effect. I covered it with green felt, then put the buttons on. Made using a Vintage reproduced Christmas Postcard. I framed the postcard using recycled red beads from a Vintage Necklace I had in my stash, resting on the left side of Santa’s beard is a lovely Rhinestone Tree made from Aurora Borealis stones topped off with a matching Star at the Top. 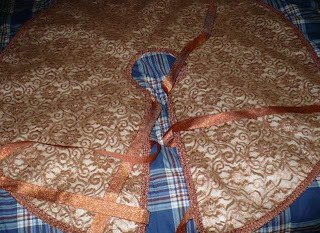 Wood Frame measures 8½ X 7 actual inside dimensions 6½ X 4½. 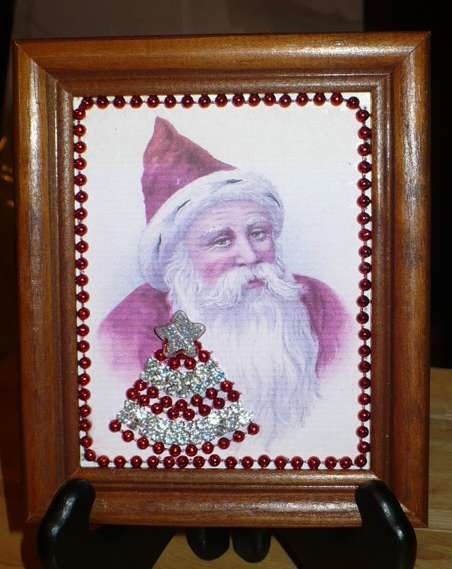 Blue Christmas designed background, Santa is a Reproduced Vintage Christmas Card, I outlined and framed the card with clear crystal Rhinestones. Santa’s beard has been embellished with snow glitter, I added a matching Rhinestone tree in the right hand bottom and on top is a Blue Star. 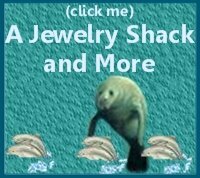 Has a saw tooth hanger to put up on wall or it can be displayed on a easel. 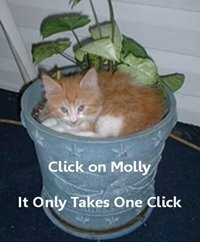 I made this with recycling in mind. 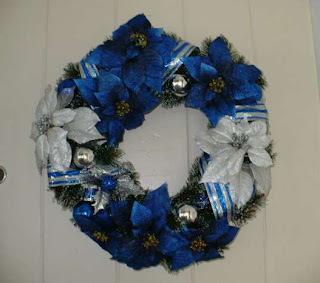 I used Hunter Green Velvet as my background, I had some red silk poinsettias left over from another project and I need 25 but only had 24 red so I used a Silver one as a topper. I then added tiny silver tone beads in the center of the red flowers and a pearl red one in the center of the silver one. Used as a tree stand is a old Vintage Silver tone Pin. 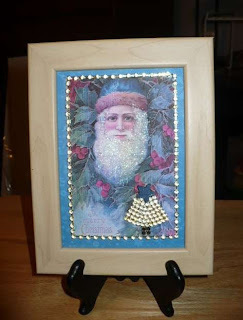 Frame is a Thrift Shop find, wood, and does not have a picture frame hanger on the back however you can add one if you wish or use a easel. 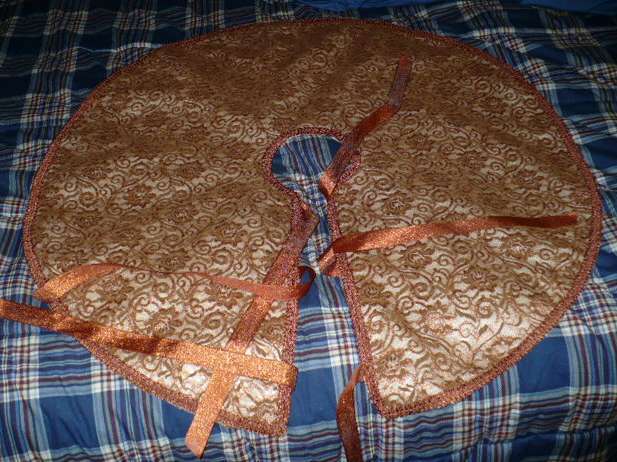 Frame measures 16 X 13. My 1st attempt at something new. Christmas card is dated 1988 so does qualify for Vintage. I matted the card then added a string of clear crystal rhinestones around the edges. Picture is of a old Barn and Sawmill with small Children outside skating on the icy pond. 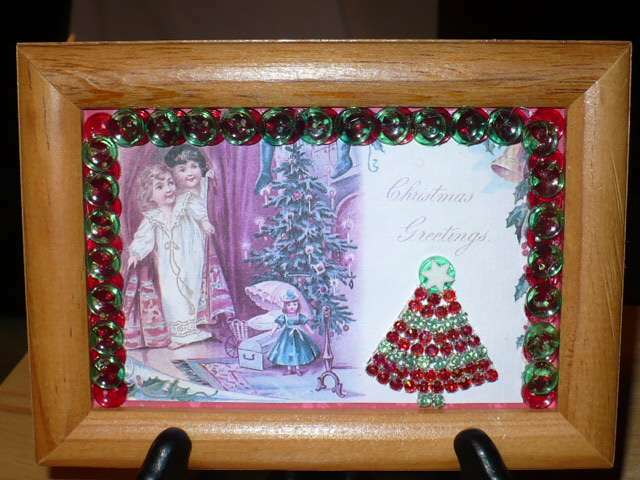 On the right hand side I made a Rhinestone Christmas Tree with both red and purple glass stones. 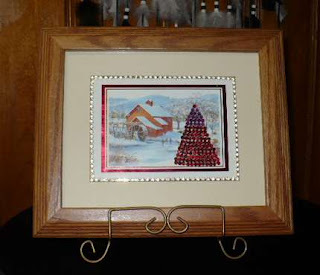 Solid wood frame with it’s own easel however you can display it with a easel if you wish.. This lovely tree is on a Gold tone wooden frame measuring 9½ X 11. 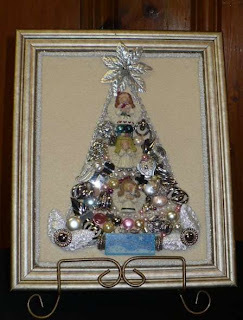 I adorned this tree with all Silver Jewelry and Faux Pearl embellishments, the back ground is a Ecru felt. I have placed 3 Angels down the center of the tree, one is praying, one is holding a candle, and the one at the top has flowers in her hand. 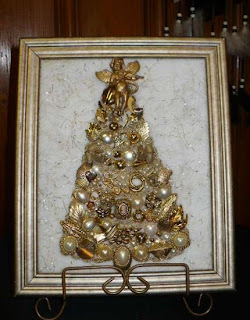 The tree has many small pieces of Vintage Jewelry, at the bottom on each corner I put silver Angel Wings, with a Peace on Earth sign in the center. At the very top I used a Silver Poinsettia, also used in the design of this tree is silver trim.